In early 2018, fighting intensified along the frontline between the cities of Taiz and Hodeidah by Ansar Allah troops and forces supported by the Saudi and Emirati-led coalition. The coalition-backed forces advanced on the strategic port of Hodeidah, on the Red Sea, before launching an attack on the city on 13 June 2018. 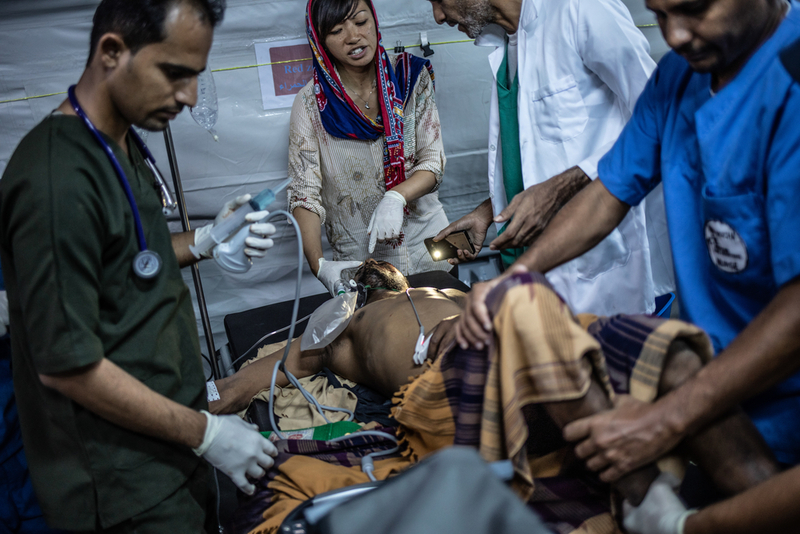 MSF set up a hospital in the city of Mocha, in Taiz governorate, in August 2018, where its teams perform emergency surgery on people injured by mines – one-third of them children. 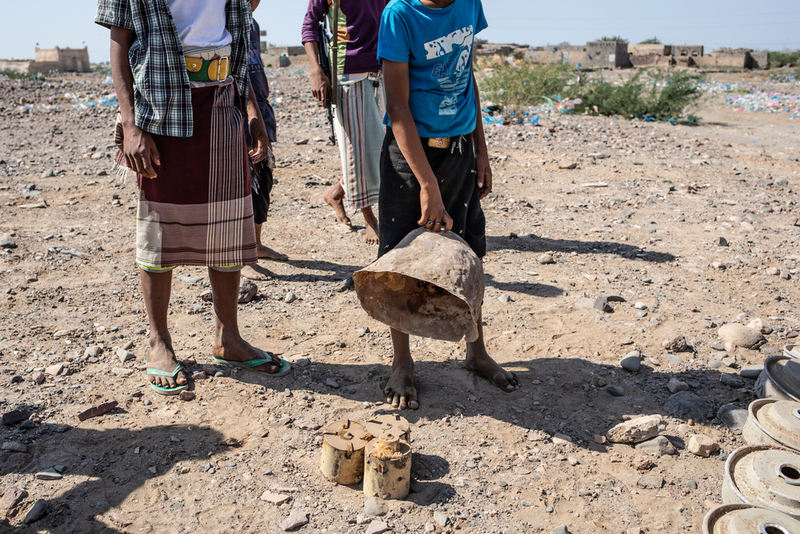 MSF urges the authorities as well as specialist organisations to step up mine clearance operations to reduce the number of people killed and injured by explosive devices in civilian areas. MSF aneasthetist checking a patient who is suffering from a head injury following a road traffic accident. 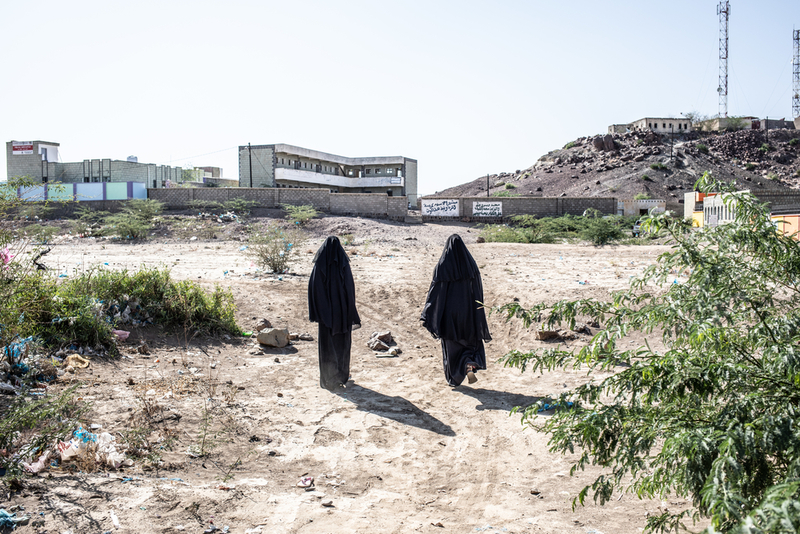 The entrance of MSF Surgical hospital in Mocha, Yemen. A child is sitting near defused rockets. Like them, 14-year-old Nasser was wounded when a mine exploded. A scar on his left hand shows where his thumb was amputated after he was hit by a bullet some years ago. Standing up on his crutches for the first time, he tries to get his balance. 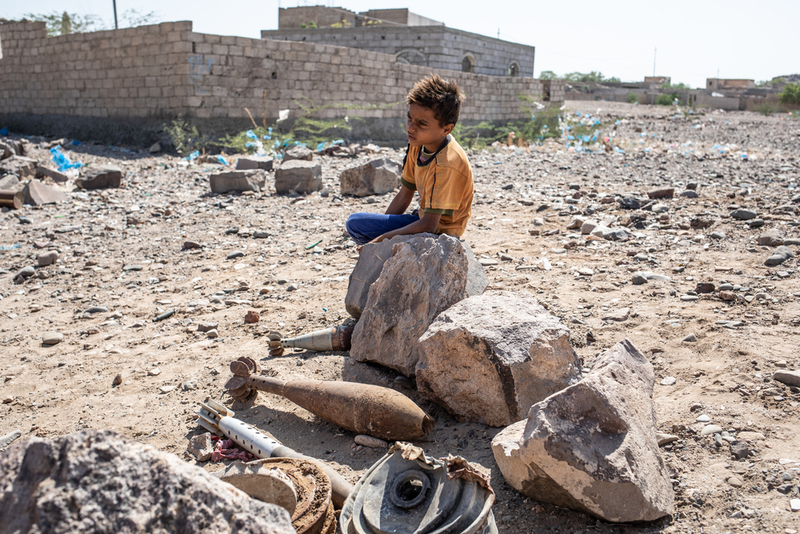 Nasser stepped on the mine on 7 December while he, his uncle and cousin were watching over the family’s sheep in a field in Mafraq Al Mocha in Taiz governorate. 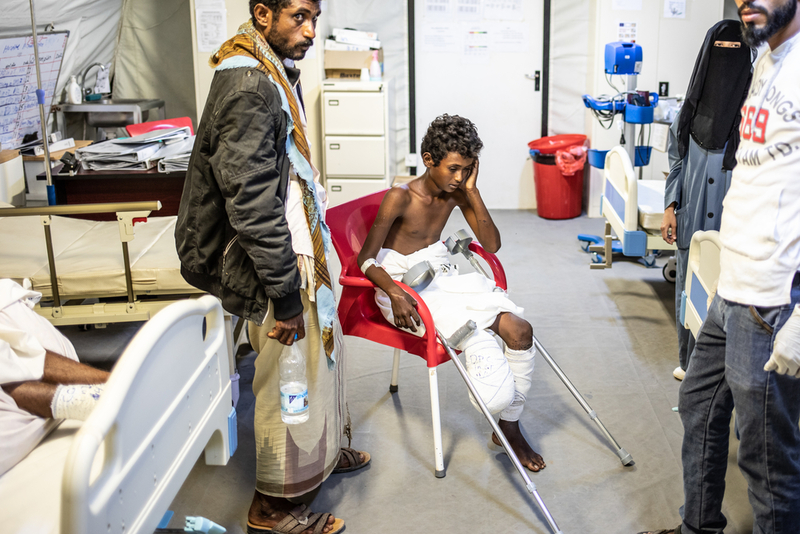 Nasser (centre) and his father Mohammed (left) in one of the inpatient wards at MSF’s surgical hospital in Mocha. Two women are walking towards the school of Mawza. A child is showing three IEDs. Mawza, Yemen. 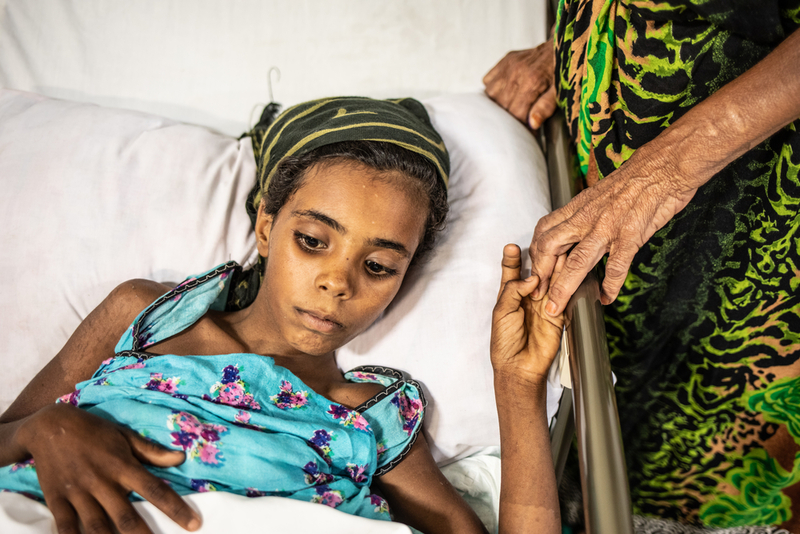 Between August and December 2018, MSF’s teams in Mocha admitted and treated more than 150 people wounded by mines, improvised explosive devices and unexploded ordnance – one third of them children, who had been playing in fields. Disabled for life, they face an uncertain future. A patient with a head injury following a road traffic accident is convulsing at the emergency room of MSF surgical hospital in Mocha. Ali (left), 18, was supposed to meet three friends in a field near his house. As he was late, he started running, and suddenly a landmine exploded. 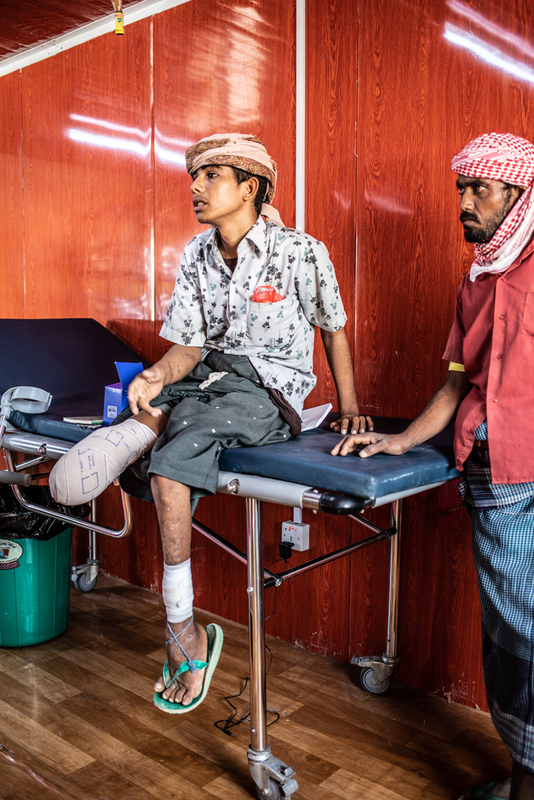 Not a day goes by without war-wounded people like Ali and Omar arriving at MSF’s hospital in Mocha from the frontlines between Taiz and Hodeidah. 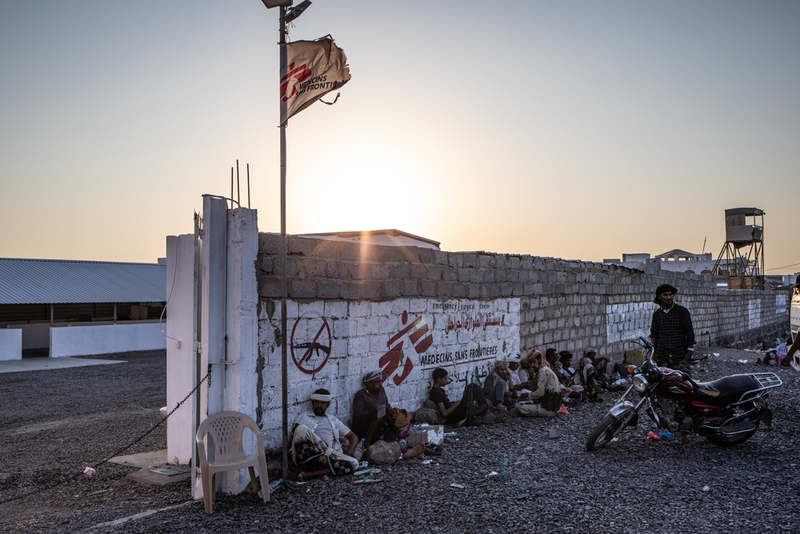 Aden, where MSF opened a specialist trauma hospital in 2012, is 450 km from Hodeidah. 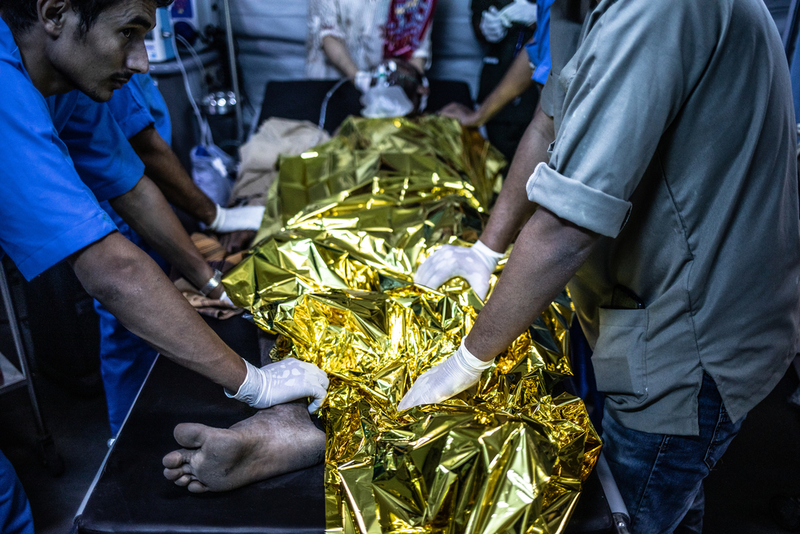 Although there is medical care available in Aden, most Yemenis don’t have the money to pay for treatment or the transport to travel there. 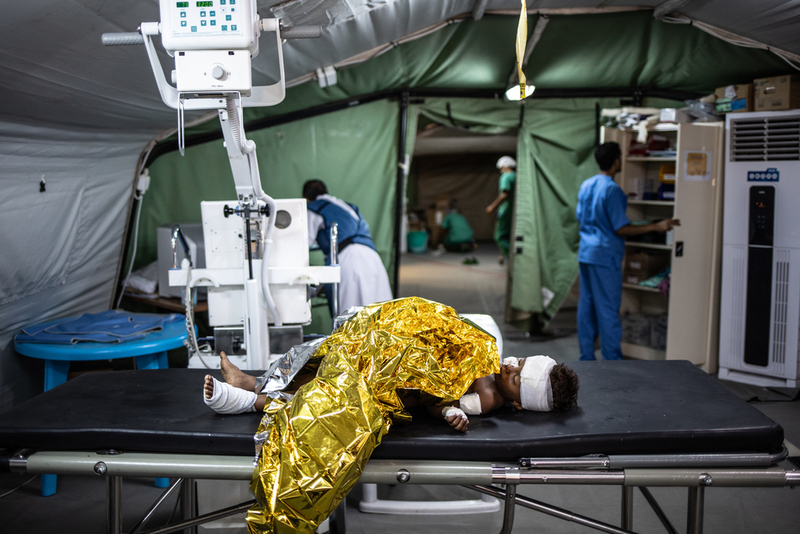 A child injured by a landmine in Mawza is waiting in the ER of MSF surgical hospital in Mocha. 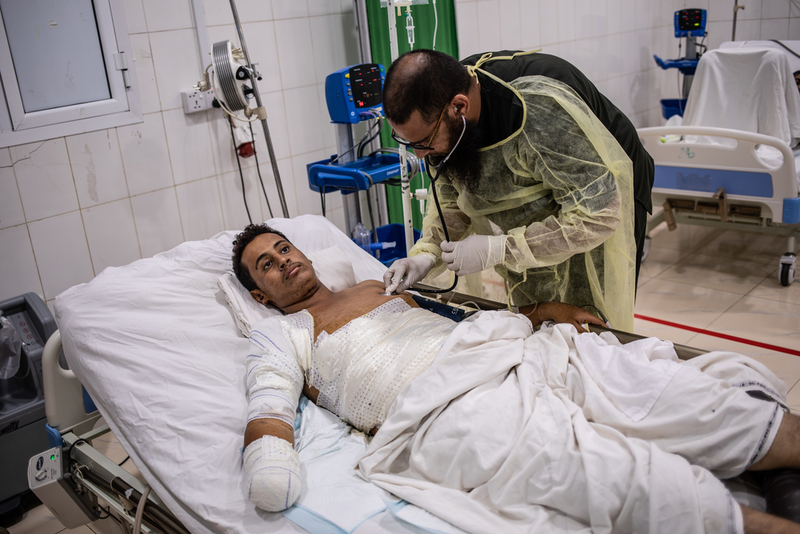 Youssef Ahmad, 18, injured by a landmine explosion while driving near Kilo 16, Hodeidah.